In the Spirit of Hope! Our annual fundraising events in beautiful Ipswich, MA, are always a great success, we look forward to seeing you on future walks! We have not yet set a date for this year's walk; please contact us to be put on our mailing list for updates. Our goal is simple - to raise funds to send breast cancer patients on short retreats to give them a mental break from the day-to-day hardship of doctors’ appointments, chemotherapy, and radiation. The retreats aim to give the patient a time for themselves (and a companion) away from the stresses of treatment and home responsibilities in a setting of carefree comfort. With our first four walks we raised over $45,000 combined! To date we have sent nearly 50 women on retreat with a companion of their choice. Their feedback has been a deeply moving endorsement of how much a few days break can mean to someone who is going through very difficult times. Words cannot express enough my gratitude! Susan’s vision was a beautiful, compassionate and loving one. I could almost feel myself accelerate with healing. Become a team captain and recruit other walkers to be part of your team. We ask each walk participant to raise $100. Set up a "donation station" at your place of business, office reception area or restaurant, we will provide the materials! FOR MAP AND DRIVING DIRECTIONS, CLICK HERE. More information, online registration and pledge forms will be available before the next walk; in the meantime, please contact us with any questions! 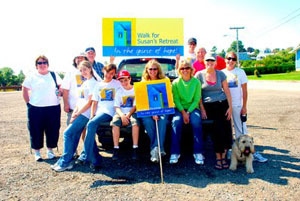 Susan's Retreat, Inc. is a public charity and all contributions are tax deductible as allowable by law. Corporate Matching Gifts are welcome. Susan's Retreat, Inc. is exempt from federal income tax under Section 510(c)(3) of the Internal Revenue Code, and is registered in New Hampshire as a nonprofit corporation.